NEW ORLEANS – The road to an NCAA team title begins now. Starting this weekend, 245 NCAA Division I men’s programs will send athletes to either Tampa, Florida, or Sacramento, California, to compete in the NCAA Division I East Preliminary Round or NCAA Division I West Preliminary Round, respectively. 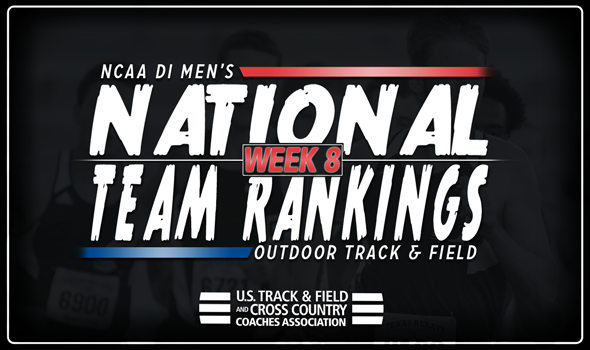 Which of those teams are favored in the most recent National Team Rankings released Monday by the U.S. Track & Field and Cross Country Coaches Association (USTFCCCA)? Florida remains the No. 1 team in the land, while Texas A&M, Texas Tech and Georgia sit No. 2, No. 3 and No. 4, respectively. Oregon rounds out the top-5 at No. 5 after leapfrogging Alabama between Week 7 and Week 8. The Gators are tied for the fifth-most entries out of any men’s team (27), but once again, it’s quality over quantity. Florida owns 10 national top-10 marks, of which six are billed in the top-5: Grant Holloway is No. 1 in the 110 hurdles and No. 2 in the long jump, KeAndre Bates is No. 3 in the triple jump, Anders Eriksson is No. 3 in the hammer and Clayton Brown sits No. 5 in the high jump, while the 4×400 relay is ranked No. 1 at 3:01.00. The Aggies feature both quality and quantity on their roster as they’ll take 30 entries to Sacramento, of which five are ranked in the top-5 nationally. Tahar Triki is the top-ranked triple jump in the nation, while the 4×400 relay sits second and Devin Dixon (800), Ioannis Kyriazis (javelin) and Will Williams (long jump) are ranked third in their respective events. The Red Raiders, who nearly overtook Texas A&M for the runner-up spot on this index, have 23 entries – and of those 23 entries, 11 are ranked in the national top-10. Texas Tech has a top-10 entry in the 100, 200, 80, 400 hurdles, 4×100, 4×400, high jump, long jump and triple jump. The Bulldogs own seven entries with national top-5 marks this late in the season, including the No. 1 billing in the 100 with Kendal Williams and a pair of second-best efforts from Denzel Comenentia in the hammer and shot put. The Ducks own the fourth-most entries out of any men’s team with 29. Oregon seized the day at the Pac-12 Championships and will look for big things from Cravon Gillespie in the sprints (No. 6 at 100, No. 9 at 200), its flock of 1500-meter runners and Damarcus Simpson in the long jump, where he leads the nation at a windy 8.33m (27-4). Here are the rest of the teams in the top-10 with their number of entries to the Preliminary Round: No. 6 Alabama (22), No. 7 BYU (35), No. 8 Houston (25), No. 9 Arkansas (37) and No. 10 LSU (16). The Razorbacks’ gaudy amount is the largest of any team from both genders. Check back next Tuesday as we’ll unveil the final National Team Rankings of the season in advance of the 2018 NCAA Division I Outdoor Track & Field Championships set to take place June 6-9 at Historic Hayward Field in Eugene, Oregon.